You can add a lot of style and a lot of convenience to your heating appliance by adding this Empire DF28MBL Decorative Glass Fireplace Front. 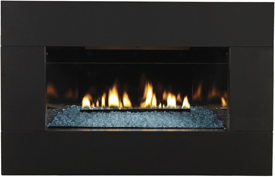 This front features a clear glass panel and has an elegant four-sided black metal frame that adds a clean, finished look to all sorts of compatible fireplaces and fireplace inserts that are listed on this item page. In addition to the decorative aspect, this front has a 1-3/4 inch depth that provides an excellent transition to drywall, tile, and other materials. To make your fireplace more complete and better looking, try installing this decorative front to your compatible heating appliance. What are the dimensions of this front? What about the glass and Frame? Overall dimensions of this frame are 40 5/8 inches wide and 26 15/32 inches tall. Glass viewing area of the unit is works with is 28 1/2 inches wide and 15 7/16 inches tall. What is the best cleaner for this surround? Any all-purpose cleaner should work just fine on the painted surface of this surround. Only the logs and glass require specialized cleaner.